In small glass bowl, mix Aioli ingredients. Cover; refrigerate. In shallow bowl, mix Spicy Bread Crumbs ingredients. Brush fish with 1 tablespoon of the butter. Coat fish on both sides with bread crumbs. In 12-inch nonstick skillet, heat remaining 2 tablespoons butter and 1 tablespoon of the vegetable oil. Cook 2 fish fillets at a time 4 to 6 minutes, turning once, until temperature in thickest part of fillet reads 145°F. Serve fish with aioli. To make tacos, fill tortillas with cooked fish and avocado; top with aioli and serve with lime wedges. Serve the fish fillets with your favorite cooked vegetables or a mixed green salad. Serve these tilapia tacos in warm corn tortillas with the aioli; add avocado and lime juice. 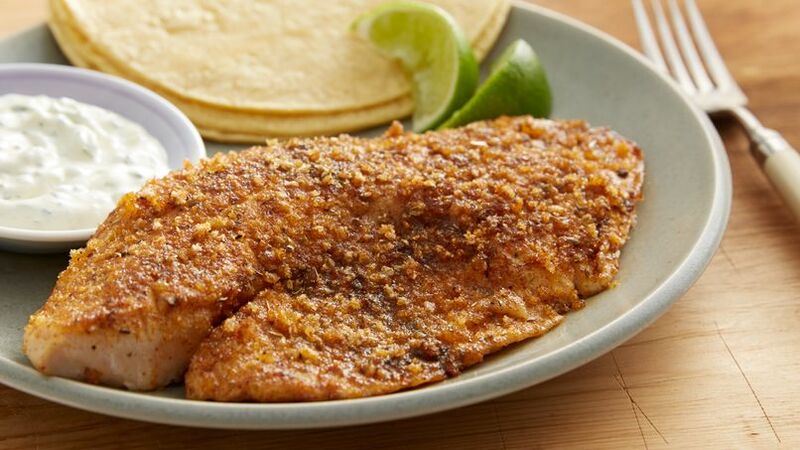 Tillapia fillets or tacos, it doesn't matter, this spicy and tasty fish will be loved by your family.